In a discussion with Goldman Sachs CEO Lloyd Blankfein in 2013, Hillary Clinton asserted that the 2011 uprising in Libya that led to the demise of dictator Muammar Qaddafi resulted in “very few civilian casualties,” comparing it favorably to the Syrian Civil War. Clinton’s remarks have been made public in a Wikileaks document release posted online last week. Clinton spoke to Blankfein, and took questions from an audience, at the Investment Banking Division (IBD) CEO Annual Conference in June 2013. Blankfein asked Clinton about the Obama administration’s strategy to handle multiple crises erupting in the Middle East, from Iran to Syria to Libya. He appeared unconvinced that the White House was adequately prepared to confront these challenges. Clinton answered with an explanation of the basic situation on the ground in Syria at the time: dictator Bashar al-Assad targeting Arab Sunni civilian populations with chemical weapons and increasingly seeing resistance from jihadist groups, while Assad continued to rely on support from Iran and Russia. Clinton noted that the idea of a no-fly zone over Syria – which the government of Turkey was at the time advocating and continues to advocate for – was a non-starter. “The idea that we would have like a no fly zone — Syria, of course, did have when it started the fourth biggest Army in the world. It had very sophisticated air defense systems. They’re getting more sophisticated thanks to Russian imports,” she explained. She contrasted this possibility with the situation in Libya. 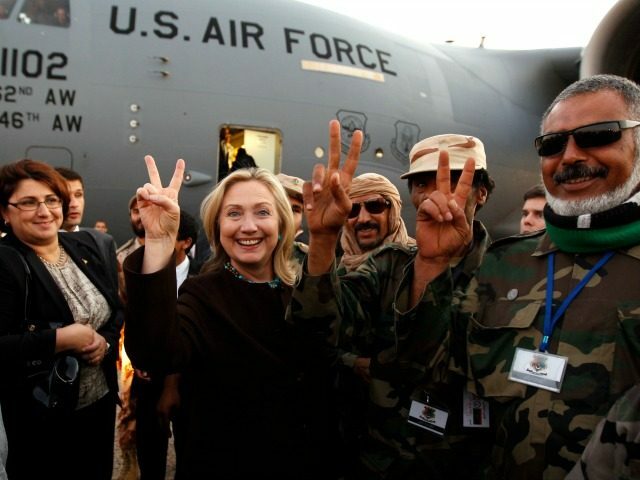 Clinton was Secretary of State at the time of the overthrow of Qaddafi. The estimates of the number dead as a result of this conflict vary widely, largely due to the chaotic nature of the situation. In February 2011, the United Nations Security Council issued a resolution asserting that “serious violations of human rights and international humanitarian law” were occurring in Libya. In October 2011, Republican Senator John McCain told reporters that the Libyan government estimated that at least 25,000 had been killed, including both those killed fighting Qaddafi’s forces and those hit by international strikes. Clinton may have been attempting to refer exclusively to civilian casualties as a result of NATO intervention, however, not the total number killed since Qaddafi lost his throne. Human Rights Watch has reported that the number of casualties due to NATO action specifically are significantly fewer – “at least 72” by May 2012 – but that NATO had not acknowledged these. The NATO deaths occurred after the organization imposed a no-fly zone in the region, the time to which Clinton referred in her remarks.